The OTO SE (not sig version) is more layered and richer sounding - but the KingKo is not embarrassed. The difficulty is my OTO was connected to my AN J/SPe back in Canada while the Kingko is connected to my set-up in Hong Kong - so I would really want to a/b them directly. The Kingko is good enough that I could part with my Line Magnetic 219IA. Hi, I just took delivery of the KA-101. I have a question, the LED status light between the VU meter does not light up at all, is that normal? The amp seems to be working normally. Yes same as mine and Richard's. I asked King and he said he'd done away with this light. I suggested he update the manual so it doesn't show this as a "Status" Light. What speakers are you using this with? I'd be interested in your thoughts on it and how you find it with other tubes (if you have any). I'm looking at trying a few others out. Yeah it's an unnecessary light because the meter lights light up to tell you it's on. So adding another light (to interfere with the sound) and draw power is unnecessary. King had a prototype with the status light (but no meters) and then decided that he really wanted the meters after all making the status light redundant. Personally I wish you could change the meter lights to different colours like blue or green or red or something - that would be cool. Maybe you can. In fact it would be neat if you could get one of those multicolour lights like on a Christmas Tree. Also if the amp is on a low shelf - the light is bright - I would like to see a cover over the light to dull it down - it's fine if you look at it straight on but not so much from above. Being a bit picky given the price though since most amps at double don't even have meters at all. And I agree with MC Rag - let us know the system you are using and the speakers. I have found that my KEF LS-50 isn't too good a match. I would not recommend the amp for these speakers. In Fact King brought the LS-50 into his shop because he wanted a demonstrator speaker and he really didn't like the combo at all. My speakers are the Audio Note E/Spx Alnico Hemp (96dB sensitive) and AN Silver Litz interconnects and Speaker cables. I used the Line Magnetic 215 CD player and 502DAC. I have upgraded the tubes on the KingKo to Rectifier RCA NOS 5u4G, Gold Lion Gold Pin 12ax7, Gold Lion EL84s. These took awhile to break in - but I like them. I am saving for an Audio Note M6 preamp and will use the KingKo as a power amp - I am actually curious how it does a power amp. My old LM 219ia is a LOT LOT better sounding as power amp. The limiting aspect of integrate amps is almost always the preamp. Thanks for the replies, I am using it as a headphone amp at the moment with the Sennheiser HD600 and the sound even with the stock tubes is really amazing, plenty of detail in the mid and highs, although bass is a bit leaner but still punchy, I kind of expected that. I listen to a lot of vocal jazz, and the Kingko really shines with that material. I don't have really sensitive speakers, my main listening room is fairly small and I just run a pair of Dali Zensor 1's on stands and a Velodyne sub with a Schiit Saga hybrid preamp (fantastic preamp for the money!) using 6SN7 in the buffer stage running to a NAD C37s as power amp. I would love to get a pair of sensitive floorstanders, probably second hand, so I am doing some research as to what might sound good with the Kingko. Any suggestions? I am excited about rolling some different tubes with the Kingko, as even with the Schiit, rolling different 6SN7 tubes even though it's acting as a buffer only, produces dramatically sound signatures! I have some Gold Lion 12AU7/12AX7 and a NOS RCA 5AR4 on the way and already have some NOS Mullard 12AU7 and Phillips Miniwatt 12AU7 ready to go! One thing I did try was to use the Kingko as a power amp and I hooked it up to the Saga preamp, and the result was an annoying hum! Switching to other inputs, the hum went away. I was wondering if there is an issue with the preamp input on the Kingko. I have emailed King about the issue and I am waiting for his reply. I have the kingko powering a pair of Rega rs1 that I picked up locally while I wait for a pair of the new Omega Jr 8xrs and I'm totally smitten. I'm running the same tube lineup as Richard and also have a pair of long plate Amperex 12au7s on the way. The tube upgrades are definitely an upgrade but tbh it sounds outstanding stock as well. This amp is ridiculous for the money. Can't wait to hear it with the Omegas. I have zero desire to try anything else. It's a looker as well imo. I also have to say that King has been incredibly friendly, professional, and helpful. I've emailed with him several times since receiving the amp and can't say enough about the service. I'm running it with Dali Fazon F5 speakers (87.5db but with easy/stable impedance load) and there's absolutely no problem with power or headroom at my usual listening levels. I like the look of Omega Junior 8XRS which is nice a sensitive at 98db. I just won a NOS Westinghouse 5U4G and 3 RCA 12AU7s on Ebay last night for a total of $30 so will see what difference these make. 12AX7s seem to be more costly so I'll have to keep my eyes peeled for a bargain. Regarding the hum issue - What you can try first is to connect the preamplifier and the KingKo to the same power bar or electric outlet. If they are already on the same line then try and split them up - one on one line and the other on another line. Weirdly this does work. In my apartment I got a very low level hum from the headphone output and I simply changed the amp over to a different outlet. Hum completely gone. Just yesterday I was getting a hum from LM 502CA DAC which I had on the same line as the KingKo. Today I moved it to the other outlet and the hum is gone. It has to do with grounding. I have the kingko powering a pair of Rega rs1 that I picked up locally while I wait for a pair of the new Omega Jr 8xrs and I'm totally smitten. The Omega Jr 8xrs seems like a great pairing for the Kingko, let us know it goes! Unfortunately, the authorized dealer in Australia is in another state, so I don't think I'll get to listen to it first hand. 98dB sensitivity @ 8 Ohms..it will make the Kingko a monster amp! Hi Richard, yes I thought it might be a grounding issue, both are on the same power outlet/bar, I will try switching one over to another outlet. I swapped out the stock (shuguang?) 12AU7 tubes and with NOS Mullard'ss and found that it's taken the edge off some sibilance/shrill I was experiencing with some vocal and strings tracks I played, the Mullards are definitely a touch more warmer, I really like it! I am relatively new to the tube world, my only other experience was with a relatively rare 60's Pioneer SA-400 tube integrated amp running 12AX7, 6BMB that was on loan from a friend who has a lot of experience with valve gear, and while it sounded good, the Kingko sounds a lot better! I can't believe the sound quality I am getting from it. My Kingko was brought over from HK by this friend and after listening it at my place, he was amazed and now wants one for himself! Yeah it's a pretty awesome amplifier and it was basically all dumb luck that I even got to hear it. When I bought my Line Magnetic from King he was working on his own amplifier - a huge hulking amplifier that I have to say looked pretty awesome. But King had been working on this amp for over a year and half and he asked me to come to his new shop to try it out. And you know how eyes can judge before the ears. Oh no not another one of these little headphone amps - I own the Antique Sound Labs MG Head DT as you can see here. Nice sound but not thrilling and cost me $500. and another similar one from Audio Space. I knew King had worked on the amplifiers in the middle (the two units in the front center and the one behind it). The big ATC speakers are King's. My old Lime Magnetic 219IA is front right. The CD player back left I also believe is King's design - or co-design. So I was sort of expecting some back breaking monstrosity. So well I already went all the way out there let's hear something and I it was really nice - he was using his own King Speakers which I have to tell you for about $400 Canadian are pretty absurdly good. He's been having some issues with the manufacturing plant so the speakers are a ways off. But if he can keep the price down and the speakers remain as good as they are now - they'll be pretty nice match. I just finished listening to some big band jazz and Joe Bonamassa and Beth Hart this evening and at quite high levels. The amp makes me grin. He has chosen a good circuit design, he has some proprietary parts he wants to keep secret and he is using a very good EI transformer and has kept the noise very low considering the budget. He is working on a preamp and the front plates. I love his idea abut offering different colours for the front plate - just unscrew the front and put the new colour on. Blue, Red, White etc. I still wish you could buy different colour lights for the meters like Blue or Red or something. And even if down the line you like that $3,000 tube amp more - you still have the KingKo as a terrific headphone amp/second stereo amp. King has the hole in the center on the bottom. So I think you can take the front feet off and just use one for the middle. But I have to check if this is what you do or if it is there for you to use with external footers. Another tweak that some audiophiles swear by. SandAndGlass, juno6000 and Done A Ton like this. Thank you for the links. I have really been looking forward to reading both! Richard Austen and juno6000 like this. I like how the faceplate on their CD player says "Compact Disc Playar"
Hi. I always review items in stock form because I think it is only fair to compare apples to apples. 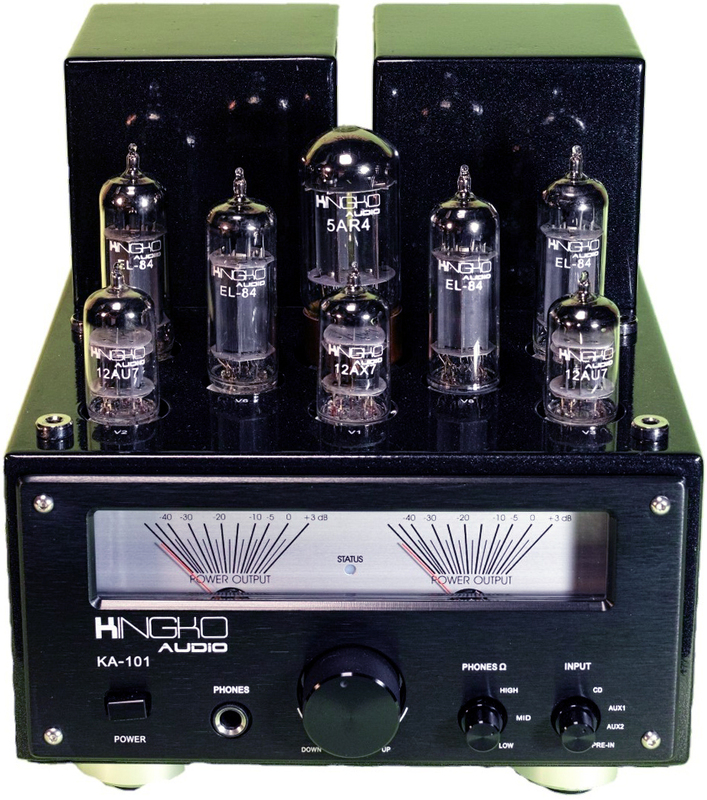 If I review the unit with tougher to find tubes or expensive tubes then I'm not reviewing an $800 amp but perhaps a $1200 amp (with those NOS tubes). And I can't possibly try every combination. It is very possible for someone to try a different combination that me and get better results (or worse). 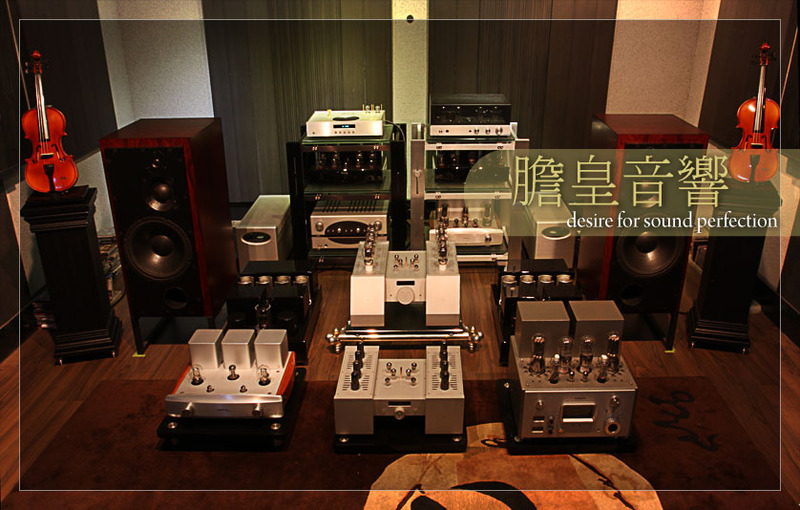 That's some of the appeal with tube amps. But it should sound good in stock form. Another aspect is what equipment one is using with the amplifier. For instance I use a tube CD player and a tube dac and speakers that were designed for tube/SET in mind. So my results will be different than someone using 85dB speakers and a SS CD player - they may very well get a brighter thinner sound. The amplifier is only one part of the stereo. I am running high efficient speakers that are quite high level and all silver cabling in the speakers and the wiring connecting everything. SandAndGlass and juno6000 like this. Maybe they ran out of Es. The CD player is interesting. It has two RCA outs on the back one for SS and one for Tube. It can output to two stereos at the same time. This isn't King's design although he has designed the output stage. The interesting thing though is how this CD player is marketed. 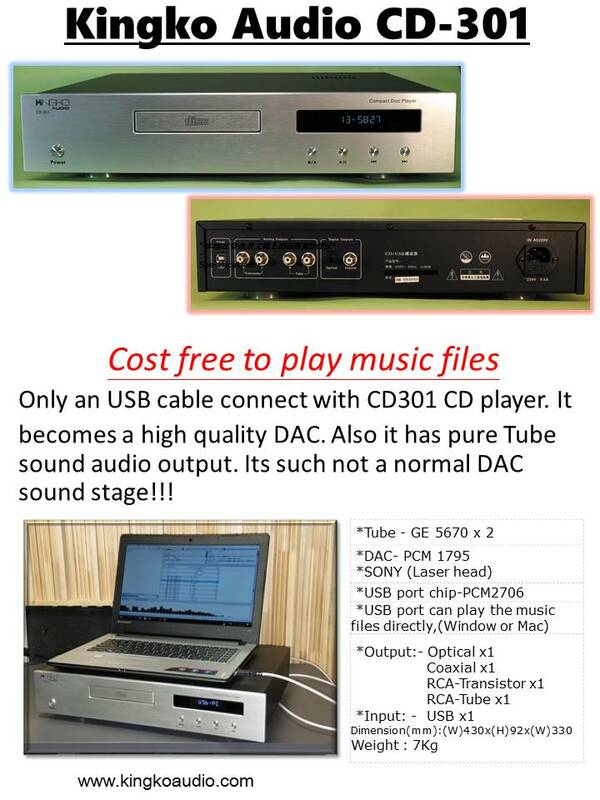 Apparently several dealers from several companies have pooled their money together to get this CD player made. Then each dealer has rights to their region. So King can sell this CD player in Hong Kong - but a dealer in Thailand gets to sell it to Thailand. They are all the same machine but they look different - with their own name on the front. I asked to review it but Kong was not sure he was allowed to sell it to the west (someone may already own the rights). The CD player is interesting. It has two RCA outs on the back one for SS and one for Tube. Heh, it wouldn't be Chinese tube-digital if there wasn't a way to unnecessarily defeat the tubes. I love it here - the love their features. They love adding switches. Feedback and no feedback and triode and UL and DACs that all seem to have SS and Tube mode. I keep telling them to make a tube only version - that way you can lower the price instead of being forced to buy a SS output. The LM DAC 502CA for example could probably be half the price if they did away with the SS output which is basically unlistenable. Does it have a digital output too? I understand you would lose the tube output, but it could be run into a tubed DAC as a transport. Richard - read your great review of the KA-101 this morning. Great stuff. In the last year, I had to downsize integrated - from a LM-518ia to a Coincident Dynamo 34se. As fortune had it, I also got to move up to a pair of Altec 9844 monitors (basically the Altec Malibu), which I've reworked and had completely restored. I'm in love with the speakers, but have been searching for something el-84-based with a few more watts for the Altecs - something along the lines of the Leben cs300xs I used to own. Up until this morning, I was looking at Eico HF-81s, old Scott and Pilot amps. I'm curious if you've ever had the opportunity to hear the Leben integrated or any of the older classic el-84 Eico/Scott/Pilot pieces and if so, could make any kind of comparison between them and the KA-101. I LOVED the tone of the Leben, but didn't have highly efficient speakers at the time and couldn't get the best from it. Greatly appreciate any input/insight you could offer. 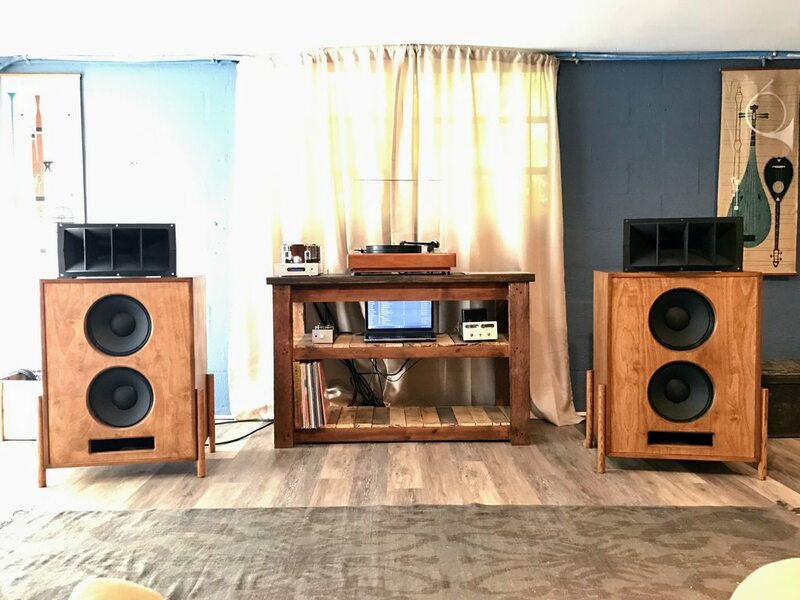 I really like the Coincident...I guess I feel that the Altecs themselves give much of the SET clarity that piece like the Coincident offers to more typical 'hi-fi' speakers. The combo is great...but nothing I've ever heard matches the magic tone of the little Leben. IanL, SandAndGlass, Ninja Bomber and 1 other person like this. SandAndGlass and Baaronj like this. But it should sound good in stock form. I fully agree that an amp should sound good with the stock tubes. And your review clearly conveys that the KingKo does sound good. But since it punches so well above its class, I think it would be fully justified to put more expensive tubes in there. Especially for retirees looking to downsize, for example. 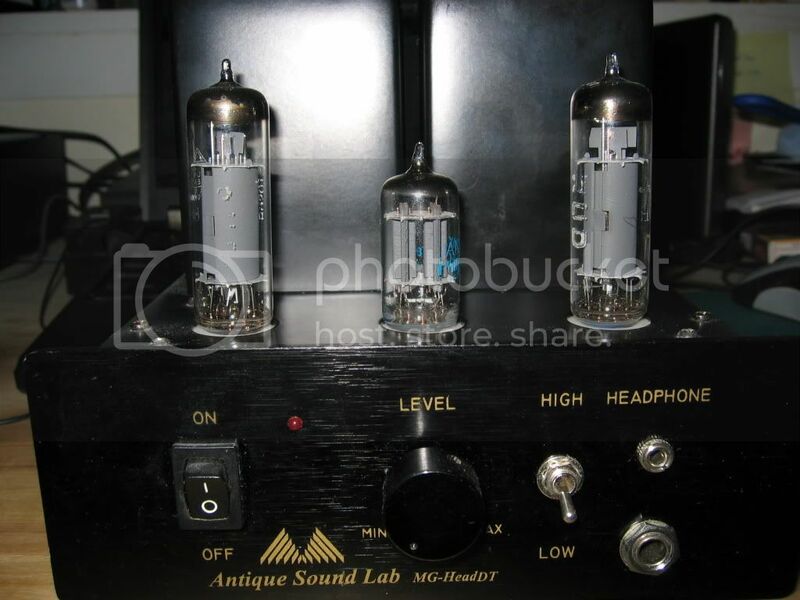 Well I have purchased the Gold Lion 12AX7 & EL84and NOS RCA 5Ug4 These 6 tubes ran me $2200HKD close to $400 Canadian. Which is not bad in the land of tubes but approaching half the price of the amplifier. At first I just replaced the 12AX7 and rectifier which was good in the sense of tone and ambiance but a little hot in the treble and more sibilant. So I added the EL84s and that issue has come away retaining the ambiance and tone. Whew. The cymbals are present without the extra sparkle. This is all without any break in on the tubes.